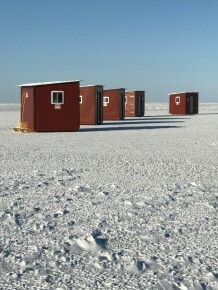 Your 6 holes inside the shack will be drilled for you each day included in your price, $125.00 per shack not per person. We select different locations on our lake based on following the fish. Our shacks are moved frequently and are very comfortable and secure. Each shack is equipped with 6 holes 10"inch diameter. We supply the paper towels and garbage bags. We have rod holders on the walls, coat and helmet hooks and a shelf for your gear. Each shack has bench seating contained within, and have pvc sliding windows for a great view of our lake. You can expect the BEST customer service during your day with us no questions asked. We do it all for you and are ready and prepared for when you arrive. 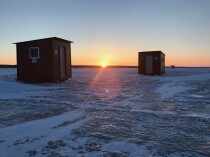 Come and experience ICE FISHING with NO HASSLES or worries, and fish with us.